Another thing worth keeping an eye on is the angle of the A-Arms with respect to the wheels when the trike is tilted. Because of the way A-Arm suspension works, the wheels are constrained to travel in an arc which is perpendicular to the A-Arms. The higher you make the body and inner pickups, the “worse” the movement of the outer tire looks in a steeply tilted turn, moving almost perpendicular to the plane of the tire itself in suspension. Compare that to a motorcycle which ALWAYS moves the tires in their own plane during suspension movement, no matter what tilt angle. You can really see the difference looking at pictures in “A” and “B” above. The Brudeli Leanster has pretty low inner A-Arm pickups with almost horizontal A-Arms and seems to do ok. The picture in “C” looks not too bad too. Because of the way A-Arm suspension works, the wheels are constrained to travel in an arc which is perpendicular to the A-Arms. This is the front end of the Brunelli Leanster, which I plan to pretty much copy verbatim. They’ve been so smart about how they’ve constructed it. The key thing to look at is the joints at the wheels. They’re two-axis affairs where the swing arm is able to pivot freely at both ends and the steering kingpin operates on its own bearing to steer the wheels. You can also see that there’s an axle where the tie rod connects that keeps the steering input from binding. Ingenious stuff! Anyway, I wanted to explore what you were talking about and that led to an interesting study on the suspension travel. I grouped a point inline with the wheel axle and then made copies of the wheel traveling through the arc of way more suspension travel than would be realistic. What I found is that not only does the wheel remain perpendicular (which I knew) but the side-to-side travel in the arc of the swing arms isn’t much at all. One thing I’ll definitely have to keep in mind is the relationship between the suspension travel and the lean stop — making sure there isn’t interference and that the tilt stops in such a way that I wouldn’t end up putting the inside wheel into the body on a full lean and a big bump. What I was trying to say is, you have to watch the “sideways” movement of the wheels in suspension relative to the direction that they would be going if they were on a motorcycle or scooter (not sideways relative to an outside observer as you drew). So for example, here is the suspension motion when vertical with grey arrowed line showing the direction the wheel would go if it were on a motorcycle (also vertical). The “sideways” movement caused by the A-Arms is measured perpendicular to the grey line, or perpendicular to the plane of the wheel. It just so happens to be the same as you’ve drawn it above. But when tilted, the motion of the wheel if it were on a motorcycle is tilted as well (see grey arrowed line). So “sideways” motion in this case is measured perpendicular to that line, which is again perpendicular to the plane of the wheel. So you have to measure “sideways” suspension movement of the wheel perpendicular to that tilted line, which is quite a bit more than shown above. In your last drawing (“Tilting Study C”) the “sideways” suspension motion doesn’t look too bad, but it’s worse than the Brudelli who’s A-Arms are nearly horizontal. But in the second drawing (“Tilting Study B”) the sideways movement of the tire appears like it would be quite large. That was the movement that I was referring to keeping an eye on as you move the inner pickups upward to gain ground clearance. There is certainly a trade-off in ground clearance vs. suspension performance when tilted. I see what you’re saying that were the wheel on a motorcycle, that’s the plain it would move in. But it’s not on a motorcycle, so I’m not following you as to what I’m supposed to be watching out for. What I’ve illustrated here is how the wheel will move as it hits bumps — as it travels through it’s vertical range of motion. Because the four sides of the parallelogram (the swing arms) are a fixed length, the wheel cannot travel in the plain you’ve illustrated. The reference points that I’ve drawn the arc on are fixed to the wheels they’re tied to and they’re traveling on the only path they can so long as they’re tied to the vehicle — therefore the 7/8″ of side-to-side shift I’ve illustrated is still accurate. According to Bob over at Tilting Motor Works, the bike doesn’t change direction nor does the lean alter when the bike goes over bumps when leaned over. So yes, some side-to-side shift does occur as the wheels go over bumps, but it’s pretty small. Keep in mind that there’s a third set of members not shown. The shocks on either side and a rod connecting them. That assembly essentially gets shorter and longer and the vehicle goes over bumps. But it has a limited travel (probably about the 3.5″ shown in the diagram). As I write that I think that now I understand where you might be confused. 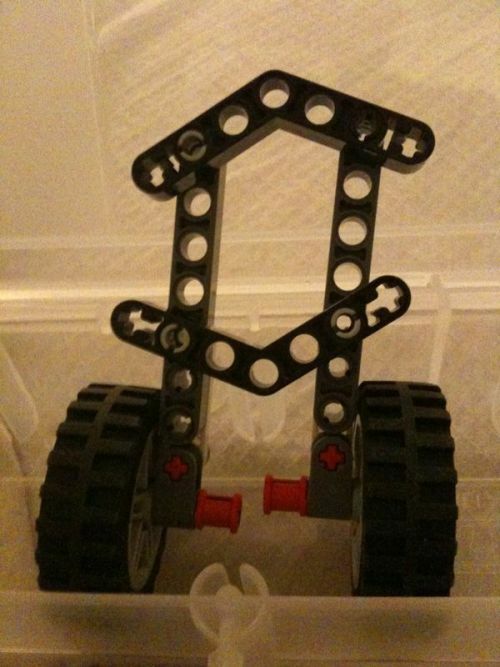 The shock is not built into the vertical piece (the kingpin) that connects the top and bottom swing arms at the wheel. That is a fixed height. And that’s why the wheel will not move on the plane you’ve drawn (like it would on a motorcycle). Refer back to the Leanster photo or take a closer look at the TMW setup. The parallelograms of the swing arms do not collapse or expand during dampening, simply one side pivots separate form the other. Here, I’ve illustrated it. That third member will move independently of the body and the swing arms. It’s attached to the bottom arms and the shocks will give up and down travel to each swing arm set independent of the tilt. In fact (and this was something it took me a long time to understand), without that third member, the suspension wouldn’t actually support the vehicle. The body would lay on the ground on its belly. That suspension member holds up the whole front end. Does it make more sense now? Or am I way off? PS. Here is a source for a joint I found which is almost identical to those on the Brudeli (which are 100% custom and PRICEY), but off the shelf and reasonably priced. But any of the vendors that I talk to hold up the red flag as soon as I mention modifying them, so you’re “off the page” as soon as they are installed in this kind of application. If nothing else, it might be worth taking one apart just to see how they are built, since they’re made to lift tons of weight at all kinds of odd angles while retaining pivoting ability on 2 axes. No, it’s not a matter of understanding how the Brudeli or Tilting Motorworks suspensions work. I understand them just fine. The piece that connects the tops of the two shocks remains largely horizontal no matter where the rest of the vehicle tilts, and the A-Arms do the same thing whether the vehicle is vertical or not. I get it. But no matter how much like a race car the vehicle looks, and even though you’re using A-Arms (which come straight from a car suspension design), it’s still a tilting vehicle with tilting vehicle dynamics including countersteer, balanced coordinated turns, etc. And if it is a “free leaner” (no power to affect tilt when under way), it’s known as a VSTV (Virtual Single Track Vehicle). Which is a fancy way to say that it will behave very similar to an identical vehicle with one tire place between the two this one has at front. Ie, a motorcycle. So no… I’m not mistaken in thinking that your suspension somehow moves the tires in their own plane when tilted. I’m saying that it DOESN’T by necessity of the A-Arm design, but that it’s less than ideal and the side effects are worth minimizing where possible. Look at the Piaggio MP3 for instance. The only real difference between it and the StreetLiner is that it has a more conventional driver position (for a scooter), and the front wheels are closer together. BUT… the suspension is arranged so that the wheels always travel up and down in their own plane the same as any 2-wheeled scooter, even when tilted, because they don’t use A-Arms. The Brudeli and the Tilting Motorworks trikes use A-Arms, but they keep them almost perfectly horizontal so that there is less suspension motion out of the tire’s plane when tilted than there would be if they were inclined with larger body ground clearance (as you contemplated above). The builders of these trikes will be the first to tell you that they work perfectly and there is no suspension induced steer or scrub when hitting bumps while tilted. They are very proud of their works and are trying to sell them too, so why would they admit any shortcomings publicly? In addition, this effect is something which grows larger at high tilt angles (which most people never use). So the changes of any average Joe noticing it on their trikes (where the A-Arms are horizontal) might be low enough to live with. So all I was trying to say was… in response to your suggesting inclining the A-Arms to gain ground clearance and seat height… be careful how much you raise the body because it will exaggerate the “out of plane” suspension motion of the wheels when tilted. According to Brudeli and Tilting Motorworks, it’s ok the way it is, but they aren’t inclined so… who knows what effect that will have? Be careful. Every design change causes a compromise somewhere else. Some are easy to notice, others not so much. Cool. I see what you’re saying. 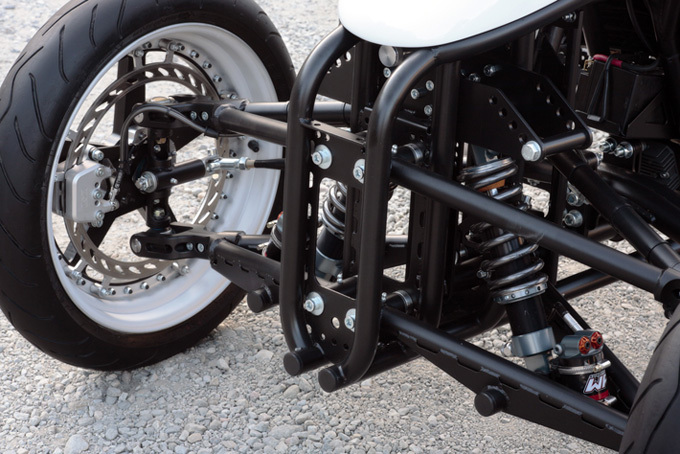 What you’re talking about – keeping the swing arms as level as possible, is one of many advantages to adopting larger front wheels. The way you’ve described it is similar in function, but the MP3 suspension is just a pair of Vespa single-leg forks turned around backward. 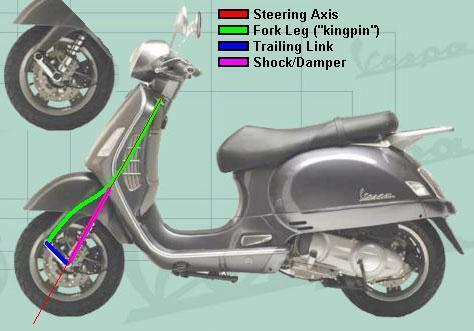 On the Vespa there is a trailing link at the bottom of the fork leg (or “kingpin” if you want to call it that), and then the shock acts between the rear end of the trailing link and the upper portion of the curved fork leg. The top of the fork leg pivots in a standard scooter (or motorcycle/bicycle) steering head which allows only rotation. There is no sliding suspension movement in the fork leg. See this image which has the unmodified suspension pasted in for clarity. The MP3 simply uses two of the Vespa suspension units (they own Vespa obviously), but then reversed the legs so that the suspension links are LEADING links, instead of trailing. You can see the leading link (orange) on the inside of the far front tire in this picture. Also, the “bent” fork legs are obvious in the front view. 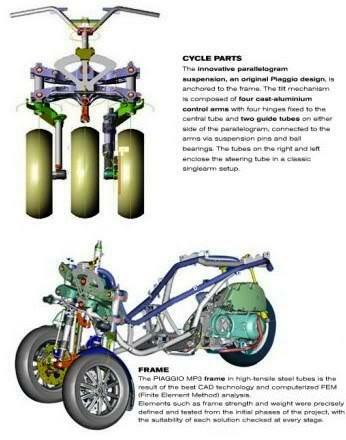 So yes, as you said Piaggio uses one parallelogram, while an A-Arm type arrangement uses two. The functional difference is that they placed their suspension OUTBOARD of the parallelogram to maintain in-plane suspension movement, the same as the original scooter had. A-Arm arrangements place the suspension INBOARD of the parallelogram. and so must break it in half to allow suspension movement, which is then constrained to travel on the A-Arm arc, not “in-plane”. You say that the StreetLiner is not a motorcycle, but no one would argue that the MP3 is anything other than a fancy scooter, right? Don’t let the bodywork fool you. The StreetLiner is still a scooter. There are other trikes which use in-plane suspension as opposed to the A-Arms used on the Brudeli and TMW, like the Yamaha Tesseract (http://www.techfresh.net/wp-content/uploads/2007/10/yamaha-tesseract.jpg) or Carlos Calleja’s custom delta trike (http://www.randolph-automotive.com/ttw/ttw_carloscallejavidal.htm). Imagine what would happen to Carlos’ trike if the rear wheels moved perpendicular to the road when it was tilted over. If someone was selling you a kit that did that, they’d say it worked fine. But seems FAR from ideal to me. Doesn’t mean that you can’t make it work, others have obviously. But just something to keep in mind. Personally I don’t like the idea of driving a motorcycle where the front wheel deflects sideways of the forks when I hit a bump mid turn. But that’s just personal preference I guess until a problem shows up on one of these reverse trikes. Not saying it’s not a motorcycle, just that what I’ve designed doesn’t have a motorcycle’s front suspension. I see what you’re saying about side-to-side shift. I’m just not worried about it. The reason I don’t think it matters is because the side-to-side travel is extremely small, and because it doesn’t just skid outward — the wheel is still turning — still moving forward. It simply means that as a wheel travels over a bump, it’ll travel over that bump on a bit of a side-to-side arc. The shock will keep the wheel in contact with the road. And if the wheel were to bounce, it wouldn’t matter if it were 1/2″ left or right when it touched the road again. I’m all too familiar with the Vespa front end. I’ve got a GT in my garage. I still thoroughly disagree that the MP3 style front end and Leanster front end are essentially the same. They’re two very different ways of doing the same thing. One with the struts in the kingpins and a solid parallelogram. The other with solid kingpins and a joint in the middle of the parallelogram and a stock connector holding the whole thing up. They’re not interchangeable and each has its own advantages and disadvantages. The third style would be the trailing-arm arrangement of Carlos Calleja’s project. It’s quite a bit of a brain stretch to imagine that working as the front suspension though. I’ll explore it. I’m really glad you’ve brought all this up. I haven’t explored an option involving an MP3-style suspension with the wheels that wide. Although I have a lot of confidence in the Leanster-style front end, I’d be remiss not to explore the other two styles at least in theory. Yeah, I DEFINATELY wasn’t trying to say that the MP3 and Leanster have the same suspension. Like you said, they use 2 completely different ways to do the same thing. What I was saying is that regardless of what they look like or how many wheels they have, they’re all (MP3, Leanster, Tesseract, Tilting Motorworks, StreetLiner) still motorcycles/scooters, and have the similar dynamics. Like saying that a car is a car, but there is a definate performance difference between using the suspension off a 65′ VW, a 95′ Cavalier, an 05′ Corvette, or a custom F1 style push-rod. I’ve just had an epiphany. I haven’t taken the time to illustrate it, but I was playing around with an MP3-style front suspension on a wide-track setup like the Streetliner. If the shock travel is in-line with the wheel (and therefore with the tilt), then the side-to-side motion is actually a lot more than if it’s able to move up and down independently (as in the Leanster setup). Which is also to say that given the amazing handling reputation of the MP3, then the side-to-side travel must not make a difference in handling. The termonology is betraying us, especially “side to side”, but it sounds like you’re starting to see what I was talking about. Try this for a second. First, put a common scooter front view immediately beside a Leanster sketch, and an MP3 too, all tilted at the same angle (because they are all going around the same corner at the same speed). Then look at your drawing from the wheels’ point of view, meaning, turn the page so that the wheels are vertical and the ground is tilted. Should be similar to riding vertical on a slanted surface I guess. Sounds like an easy experiment to go out and try. Now put a bump across the road (uniform height speedbump) so that it hits all five wheels at the same time. Look first at the scooter. Which way does the scooter wheel go over the bump? Does it push off perpendicular to the road surface, or does the rolling tire “climb” over the bump (ie. going “up” in this tilted view) while remaining in its own plane? What about the MP3? It has a pair of scooter suspension arms, so its wheels should move in the same direction as the scooter, right? The only difference is that there are two of them going over the bump instead of one. What would happen to the MP3 if the tires moved perpendicular to the road instead? Now look at the Leanster and cover up the suspension with your hand for a minute. If the wheel were rolling along this slanted surface without any vehicle attached to it at all, which way would it roll over the bump? Wouldn’t that be the least stressful (lowest energy) way? Last, uncover the suspension and look at the whole Leanster together. The A-Arm suspension forces the wheels to move pretty much perpendicular to the road surface when they go over the bump, that much is known. But is that the least stressful, lowest energy, way to cross the bump? Should its motion be any different than the scooter, MP3, or the free rolling wheel? If so, why? And which wheel do you think is moving “side to side” the most now? The free wheel, the scooter, the MP3, or the Leanster? Hello But you need that the front wheels tilt diferent because you need that it axel cut in the same point wiht the rear wheel. Sorry, I don’t quite understand what you’re asking. The wheels tilt so that the trike can turn sharper at fast speeds. Thanks Thomas. I haven’t looked at this stuff in a while, but this is great information. Thanks for sharing it.